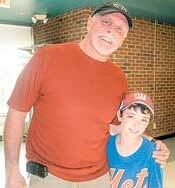 Major League baseball’s first designated hitter, Ron Blomberg, was a special guest at a barbecue on Sunday marking the conclusion of Yavneh Youth League baseball’s regular season. The author of “Designated Hebrew” (Sports Publishing), written with Dan Schlossberg of Fair Lawn, Blomberg was the New York Yankees first draft pick in 1967. His career ended prematurely because of injury. There was no special dedication for the season just past. Former N.Y. Yankee Ron Blomberg, with Yavneh Youth League player Avi Eisenstadter of the Campmor White Sox at a June 6 barbecue. The YYL has five divisions: a coed instructional division (first grade), junior boys and girls (grades two to four), senior boys and girls (grades five to eight). Unlike most youth leagues in the area, the YYL plays softball as opposed to baseball. Through a connection with Ira Stern, the sports director of Camp Nesher, the YYL invited Ron Blomberg to speak to the kids and families about his life in baseball as a Jew. Blomberg added, “When I grew up … half my [youth baseball] teammates were in the KKK,” the Ku Klux Klan, and he stressed that area kids are lucky to be able to play not only free of anti-Semitism but also in an entirely Jewish league that takes the Jewish calendar into account. After his speech, the athletes lined up to get his autograph, with sponsors of the event receiving autographed copies of his book.